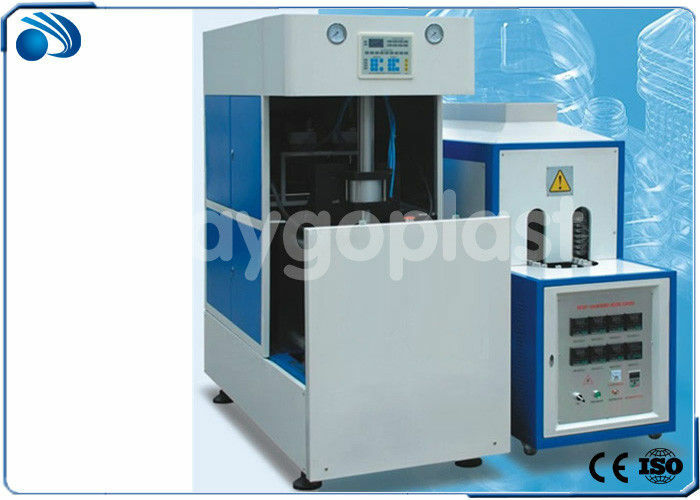 FG-9B semi-automatic bottle blow molding machine is suitable for producing PET plastic containers and bottles from 5L-10L. It is widely used to produce the carbonated bottle ,mineral water, pesticide bottle, oil bottle, cosmetics bottle, wide-mouth bottle etc. 1. Adopting double crank to adjust mould, heavy locking mould, stable and fast ,Adopt infrared oven to heat the preform, the preform rotated and heated equally. 2. The air system has been divided into two parts: physical movement of machine and blowing movement. It can provide sufficient and steady high pressure for blowing large irregular shaped bottles. 4. The machine can be operated in the step-by-step mode and the semi-auto mode. 5. The machine is small with low investment, easy to operate. We have 1 year warranty, and lifetime maintenance. Within one year, if there is some accessory going wrong, we will send at once, free of charge. 1) Within one month, if the machine is of any big fails, we will send you at once. We have a stand-by team to provide after-sale service. 2) Within one year, if you send back the equipment for repair, we will charge the repair, including the accessories. Both of them are free. 3) After one years, we offer to repair the machine, but we quire fo changed parts, not for manual cost. 4) No responsibility for man-made destroy. 5) If the buyer has any questions from our technical department, we service Or we can send professional engineers to help you debug them.